Nondestructive inspection and technical diagnostics have played the important role in problems of quality assurance of the reusable BURAN Orbiter. System and comprehensive approach of using the technology of control on all life cycles of the vehicle has in many respects determined the high reliability of the spacecraft. The basic scientific and technical achievements in different areas of a nondestructive inspection are briefly determined, the economic aspects of developments and main directions of its conversion in different industries are explained in the paper. The reusable BURAN orbital spaceship (OS), as a flying vehicle, essentially differs from the aviation crafts by operation conditions, design, materials, onboard systems and conditions of crew habitation. the environment of habitation and vital functions of crew. The provision of reliable construction operation at the minimum value of mass under conditions of combined effect of high temperatures, plasma, static, dynamic, vibrational and acoustic loads has forced the developers to create and to use a lot of new constructional, heat resisting and heat-protecting materials. It required creating new production equipment, including the methodology of complex use of methods, means and technology of control on all life cycles of the BURAN Orbiter. Thus, tiles of Thermal Protection System (TPS) consists of 10 new components not used earlier in the industry, which combination has allowed to attach its to an aerodynamic surface of the BURAN Orbiter’s construction. Same the GRAVIMOL carbon-carbon material was completely new, from which the heat resisting fuselage and wing edges were made. For the first time in domestic practice, carbon-plastic load-bearing structures were widely applied of a total surface of more than 120 m2. For onboard systems of the BURAN Orbiter the requirement to Q&D were set by specifications and requirements on their acceptance and aboard installation at handing over to the Customer, the extreme permissible levels of inspected parameters under conditions of production and maintenance were determined. Q&D system simultaneously inspected the operation conditions so that there was an opportunity to take measures eliminating occurrence of emergency situations. One of examples of this approach is explained in the paper of the present book devoted to creation of a Auxiliary Power Unit (APU). The quality and diagnostics system was integrated in a united whole for obtaining the maximum information about technical state of the BURAN Orbiter. This system also allowed obtaining information about possibility of the Orbiter operation according to its technical state. The information of Q&D was included in the general unified system for control of onboard systems to minimize the effect of any abnormal situation. In this paper, attention is focused on the development of methods, means and technology of a nondestructive inspection (NDI) of materials and components of the BURAN Orbiter’s airframe. The methodology of quality and reliability control of any industrial systems by means of the nondestructive inspection (NDI) is determined by choosing the principle of their designing. Until recently, the designing according to service life was applied in aircraft engineering. Nondestructive inspection was conventionally stipulated at production phase, and to a lesser degree – at the stage of tests, for clarification of the calculated strength properties, preset by designers, and in a minimum volume – at operation. But its basic task is a detection of defects, such as disturbance of materials and construction continuousness (cracks, laminations, unsoldered locations, unglued locations), measurement of coatings thicknesss, materials, etc. The design and operation of vehicles according to technical state is more progressive . Such principle allows essentially increasing the time of flying vehicles operation at simultaneous operational cost reduction . The principle of designing according to technical state dictates the greatest possible requirements to the characteristics of construction materials, their stability and dynamics of units and modules degradation. The designer practically does not have safety margins of strength included by him in a design as a compensation for manufacturing processes instability, dispersion of physical mechanic properties, inaccuracy of calculation, and insufficiency of testing. The aggregate level of adopted assumptions is compensated by different methods, from which the most effective is a wide-scale application of methods, means and technologies of nondestructive inspection. Both in domestic and international practice, NDI application for vehicles designed and operated according to technical state is not so the widely known. Therefore, the experience of their usage for the BURAN reusable orbiter is of interest for many industries. The BURAN Orbiter was created during a hard rivalry in space between two global States. A destiny of the whole program substantially depend on that how fast and how completely the high- efficient technologies of welding, manufacturing and coating of TPS tiles, tight-sealing of modules and units and dozens of other completely new technologies were developed and mastered. Under such conditions it was difficult to guarantee a stability of new technology processes, construction materials properties and optimality of design solutions implemented practically from a draft, at complete guaranty of requirements of reliability. In such situation, it was allowed to nondestructive inspection the unique opportunity to control quality, in many cases, and to provide evidences of reliability, required for the vehicle. The conditions of provision of the Orbiter’s reliability demanded to determine not only the defects of continuousness and their geometrical sizes estimation which were decreasing the lift capability of the object under control, but also to diagnose the conditions prior to these defects occurrence. For this reason, besides the conventional tasks of defectoscopy control of materials and constructions integrity, the absolute must of qualitative and quantitative assessment of physic-mechanical parameters of objects under control appeared, such as strength, density, Young's modulus, etc. At that, the determination error of the majority of these parameters, dictated by the requirements of reliability to BURAN Orbiter, should not exceed 10%. These requirements were formulated jointly by designers, experts on strength, period service life, testing and technologists. All possessed experience was generalized. For the first time in domestic practice, the physically justified level of permissible defects was determined for materials and constructions, periodicity of the control for each stage of Orbiter’ life cycle. The indicated requirements predetermined the selection of existing, and necessity of development of new means of control, search of informative parameters of physical fields and radiation used in control techniques for estimation and prediction of the technical state of details and units. All kinds of NDI available in world practice including those earlier not used in the industry were used for BURAN Orbiter control. creating a computer system for assembly, storage, processing and analysis of NDI outcomes with a capability of estimation and forecast of probable changes of technical state of the Orbiter and its systems, timely updating of designer’s documentation and optimization of regulations on NDI works. A system of quality control by means of NDI designed and implemented for the BURAN Orbiter, being the component of the general system of quality control and covering the whole life cycle of the Orbiter. The developed technology of the nondestructive inspection has completely provided the flaw detection control and physic-mechanical properties control (density, strength, Young's modulus, etc. ), which were earlier determined only on samples with the help of destruction. The control was carried out using both separate methods and means, and their different combinations. Existing methods and means could not in a full volume solve all tasks of the nondestructive inspection during creating of the BURAN Orbiter. Pursuant to the above-stated, the further development of the theory and practice of developing and using of NDI means was necessary with to increase their sensitivity, productivity and outcomes authenticity. The work on nondestructive inspection was fulfilled in tight cooperation with leading firms and experts of the Soviet Union. It has allowed reaching essentially new results on each direction of NDI, which gave a powerful impulse to the further qualitatively new domestic developments of means and techniques with wide-range application in computer technology. The accumulated scientific and practical experience up to this day allows to supply ideas to domestic and foreign developers. In the field of radiation control, Mr.: Rumyantsev, Borisov O.I, Dobromyslov V.A., Belyanin P.N., Korovanov Yu.N. (NIAT), Goltsev V.A. (VIAM), Vainberg E.I, Firstov V.G. (MNPO Spektr), Gagin Ye.N., Ognev V.M. (NPO Molniya) and many others worked very friendly and creatively. In radiation flaw detection, the algorithms of forming and processing of image were designed. They increased sensitivity and resolution of tomography system. Methods of reverse projection with filtrating process are the basis of algorithms. High-frequency filtration using the operation of double differentiation allows to reduce the processing time and to improve the image quality. These studies resulted in creation of the VT-300 x-ray computing tomograph. It is necessary to mark a great contribution to the field of thermal NDI of Mr.: Gerashchenko O.A (ITTF, Kiev), Vavilov V.F. (TPI, Tomsk), Ketkovich A.A. (MNPO Spektr), Morozov (VIAM) G.A., Upadyshev A.B., Yeremin G.L., Mayorov A.P. (NPO Molniya). The new correlation of thermal energy propagation in anisotropic medium were detected, the ways of noncontact pulse heating were designed, digital programmed thermal imaging measuring systems with extended spectral range were created. Much work in the field of the radiowave inspection was performed by Mr.: Konnov V.V., Demidov V.V (NPO Molniya), Tikhonovich V.S. (IPF, Minsk), Matveev V.I. (MNPO Spektr) and others. New methods of formation and registration of microwave fields were created in the field of radiowave nondestructive inspection on the basis of broadband generators, strip structures and digital methods of processing multi-parameter information. It has allowed making and implementing essentially new means, such as the SV-10AM moisture meter, the ST-10I thickness gauge, the SP10A densimeter. A whole cohort of the leading experts of the country worked in the field of vortex-flow inspection. Among them, Mr.: Fodoseenko Yu.K., Muzhitsky V.F. (MNPO Spektr); Fastritsky V.S. (RPI, Riga); Grishakin A.I., Mrs. Dolgova N.S. (NPO Molniya). New ways of 3D formation of scanning electromagnetic fields and digital methods of processing multidimensional signals connected with the inspected parameters of the studied medium by complicated non-linear functional relations were researched in the field of vortex-flow NDI. As a result, the VD-65 basic vortex-flow flaw detector was created. This detector visualized the electromagnetic field in the inspected object that allowed to see a defect and to determine its geometrical sizes. In the field of the acoustic nondestructive inspection, great contribution was made by Mr.: Azarov N.T. (NIAT), Uralsky M.P., Murashov V.V. (VIAM), Buylo S.I. (RGU, Rostov-na-Donu), Shchurov A.I. (GGU, Nizhny Novgorod), Dementiev Yu.S., Rozhkov V.I. (NPO Molniya), etc. The effective ways of forming acoustic fields of given form, acoustic signals reflection and reception, acoustic-optical imaging systems, the identification methods of defects types and the estimation methods of their sizes were designed. New types of converters, ways of increase of sensitivity, accuracy and authenticity of inspection, the noncontact measuring ways of vibration, dosed shock with application of laser, fiber-optical and other methods were created in the field of vibration diagnostic. A number of new methods were studied and implemented, in particular, method of electromagnetic emission used for forecasting the service life of thermal heat protection, a method of dynamic indentation for measuring mechanical properties of material of damping back, heat protection and physic-mechanical parameters of metals. More than 96 types of NDI means for different purpose were designed, manufactured and tested with the usage of acoustic, thermal, vortex-current, radiation and microwave fields and radiation. The majority of them became the prototypes of serial devices, which are just as good as the best foreign specimens. It allowed beginning the modernization of domestic industry with the means of inspection at a qualitatively new level. The complex of inter-branch specification-technological documents referred to cooperation-creators of the BURAN Orbiter was developed and implemented in the field of NDI metrology support. This complex determined unified rules and the standards of metrology monitoring of NDI means, standard samples and methods of certification and metrology service of the nondestructive inspection means. The significant contribution in this field was made by Mr.: Agapov Yu.N. (NIISU), Drobot Yu.P., Mrs. Yunnikova V.V. (NIIFTRI, Khabarovsk), etc. The full-scale database (DB) of the nondestructive inspection was developed. DB contains whole information about parts, modules and units, from since the design stage and to their utilization. The ordered information of DB is used for diagnostics of materials and constructions degradation and allows, with a high level of reliability, to forecast their technical state. In the work on the systemized and integrated usage of nondestructive inspection for BURAN Orbiter the following persons participated: Mr. Klyuev V.V., (MNPO SPEKTR); Denel A.S. (VIAM); Borisov O.I. (NIAT); Potapov A.I. (LSZPI, St.-Petersburg); Borodin Yu.P. (TsAGI). In the process of accomplishing works on NDI, the whole school of experts was created. Themes under Orbiter’ inspection were laid in the basis of 5 doctoral of high-degree and 24 doctoral of low-degree theses, more than 200 copyright certificates are obtained by researchers, over 240 papers are published in the open and closed press. New and most complicated problems were solved in the field of Thermal Protection System (TPS). 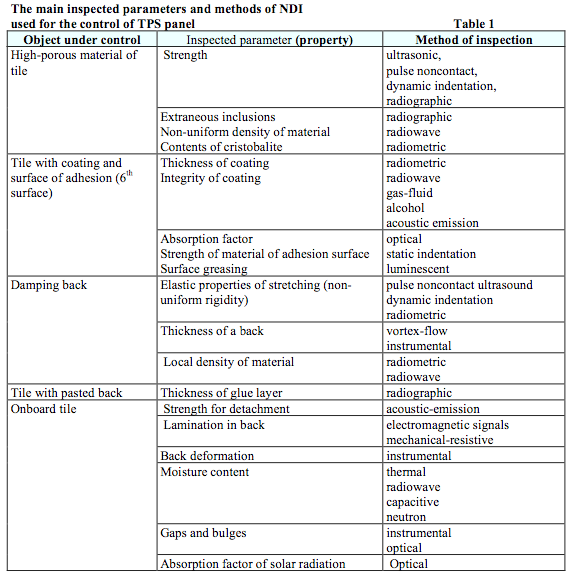 The main inspected parameters of TPS tile are displayed in Tab. 1 as an example. From the table it is visible, how unconventional the list of inspected parameters and physical methods used for their control were. Similar non-conventional the list of inspected parameters for carbon-plastics appears to be, of GRAVIMOL heat-protective material (not displayed in this article). The relative value of costs for the major components of NDI technology for BURAN Orbiter under conditions of production (Tab. 2) is of interest. It is necessary to pay attention to rather a high cost of works on TPS materials and constructions, which is more than ¾ of the cost of development of the general NDI technology. It is clear, as the overwhelming majority of the new tasks arose just in this direction. The gained experience of works on interaction of physical fields and radiation with different classes of materials and constructions made of them allows considerably to reduce a scope of works on the search of informative parameters determining the quality of inspected object. It gives us advantage before the potential competitors and, until now, allows us to hold the leading position in many aspects and without large time and cost expenses to intrude into different technological operations and industries. In order to maintain the high reliability of the Orbiter by means of nondestructive inspection, it is necessary to achieve the maximum control availability both of separate parts and units and the flying vehicle as a whole. Control availability is a property of an article permitting to ensure the access of means of control to the inspected objects, critically influences on the probability of detection of different by nature defects and the cost of monitoring operations. The probability of defects detection can be considerably increased, if decrease the level of requirements to their allowable values, which is rather frequent in practice. At that it is necessary to remember, that such approach results in overrating of construction mass-dimensions parameters and reduction of terms of its accident-free operation. The probability of defects detection at a different reject level of fault detection by NDI methods in metallic structures of BURAN Orbiter is shown in Tab. 3. Displayed data show that to reach the given level of probability of defects detection, it is necessary either to design the article in such a way that level of control availability applied in it ensured the maximum sensitivity of NDI methods, or to raise the level of permissible defects. In case of airspace industry, where the minimum mass-dimensions features prevail over all other, it is necessary to involve NDI at the earliest stages of design to ensure the greatest possible control availability. The probability of defects detection increases for different combinations of NDI methods. Some combinations applied for the BURAN Orbiter are shown in Tab. 4. Tab. 4 shows that the probability of defects detection at usage of two and more methods increases, but this circumstance results in considerable rise of time and financial expenditures on the nondestructive inspection. 1. Theoretical and experimental definition of correlations between the physical properties of objects under control and their availability index. 2. Adapting the existing means of control and development of new ones. 3. Metrology maintenance of the control technology. The relative cost of development stages of NDI for TPS tiles of BURAN Orbiter is displayed in Tab. 5. Displayed data show that the search and metrology support of physical properties permitting to evaluate the technical state of objects under inspection have composed the most high technology and cost intensive part of works. As a result of the chosen strategy of quality control, it became possible to execute the economically reasonable distribution of costs for the control of BURAN Orbiter for different stages of life cycle which is confirmed by data of Tab. 6. Specific contribution of separate kinds of the inspection into the general labor input of the nondestructive inspection at different stages of BURAN Orbiter’ life cycle is shown in Tab. 7. From Tab. 7 it is visible that under conditions of production the conventional techniques (radiation, acoustic) prevailed above the methods new to the industry (optical, thermal, radiowave, acoustic emission, etc. ), however, under operating conditions this correlation vary, which has allowed to decrease sharply the labor input of the inspection. The works fulfilled at the first stage on NDI of the BURAN Orbiter after its successful flight have completely proved the choice of methods, means and efficiency of the developed inspection technologies. The nondestructive inspection technology of the BURAN Orbiter allows, to inspect with high reliability more than 50 physical properties describing condition of materials, constructions, stability of different manufacturing processes and to ensure the necessary quality level. The cost of operating control technology of BURAN Orbiter is approximately 12% of the budget cost of the project. Taking into account the gained these works by 1,5…2 times for new generations of reusable orbiters, and methodology of quality control by means of NDI can be widely applied in different industries of Russia. The complicated economic situation which has been formed in the industry of Russia, has helped the development of efficient conversion processes including NDI technologies. 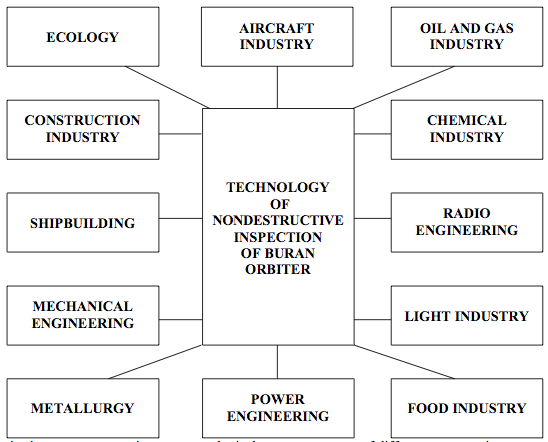 The general scheme of actual usage of the nondestructive inspection in different directions of the national economy is shown in Fig. 1. A brief review of achievements on some branches is explained below. Certification and nondestructive inspection. The experience of combined application of control for BURAN Orbiter allows to use NDI as means of obtaining proof of the degree of quality and consequently of reliability, and to recommend NDI as the major method of products or production certification in different industries. This proof is based on application of a certain for each situation physical ‘filter’ and the preset tolerances for physical parameters of object under control. If these parameters are within the preset tolerances, the object is considered to meet the appropriate requirements of quality, and on the contrary. Wide-scale usage of methods and means of NDI allows to develop a system of quality for production and to prepare production for certification. For conditions of Russia, where the problems of certification under the requirements of international standards of ISO9000 series become actual, the usage of NDI as a mehtod of certification acquires a critical importance. Using of NDI grants a experience, it is possible to reduce the cost of unique opportunity to give a start to large-scale certification of industrial products at minimum economic costs. Nondestructive inspection for main pipelines. One of the first conversion works was the development of the inspection system of technical state for main pipelines (MP). Provision of no-failure operation of the main pipeline is the major problem of population safety. The prime task is the reduction of emergency situations due to creation of advanced technologies of control, diagnostics and monitoring. The performed analysis show the absence of a multilevel system of information accumulation and processing in the country, which would permit to execute a regular monitoring of main pipelines including hard-to-reach sites. The offered scheme of the combined diagnostics of MP is based in its maintenance on the last achievements of NDI, and provides for the high degree of safety. The cost of such inspection for the pipeline of length of 10…12 thousand km is 50…120 doll/km per year. Nondestructive inspection for objects of State Mining and Technical Inspection. The wide experience is accumulated during at the inspection of boilers. Besides the flaw detection control, the works on identification of materials, detection of a micro-hardness, strength properties, metal hydrogenation and determining residual service life are carried out. Ecology. The automated network for ecological information accumulation is offered for wide-range use with engaging of different fixed, ground-based mobile and aerospace complexes of NDI, and also to execute fire-prevention monitoring over large territories, to estimate ecological consequences of different emergencies. Construction. Inspection and estimation of the technical state of complex objects (bridges, trusses, buildings, dams), concrete strength, building materials moisture, thermal and water leakes, etc. Shipbuilding. Control of integrity of bodies, load-bearing elements and power plants, geometry and condition of propellers, corrosion wearing, thickness of paint coatings. Metallurgy. Control of condition of converters, blast furnaces, rolling mills, blend, coke, ores and other metallurgical components, rapid determination of melt chemical composition, temperature measurement. Chemical industry. Control of condition of chemical reactors, pressure vessels, pipelines, leakages in storages. Food-processing industry. Control of condition of loose products (moisture, temperature, weight dosage), technical state of elevators and storage conditions of grain. Auto-tractor industry. Control of the surface preparation before laying paint coating, thickness of coating, physico-mechanical parameters and quality of casting, the rapid determination of melt chemical composition, estimation of the technical state of motor transport, engines and transmissions, quality control of ball-bearings. Materials and design solutions used at creation of the BURAN Orbiter will be applied widely in new generations of different projects of Russia (especially airspace). Chief designers of these systems should remember the gained experience of application of the nondestructive inspection in the control system of quality and reliability of different developments. This experience is unique and is the national property of Russia. Its wide-scale usage in different industries will bring huge economic benefit and can form the basis for reaching the new degree of products quality. 1. A.K. Starostin. The concepts of reliability and ways of their implementation. - Kiev: UkrNIINTI of Gosplan USSR, 1991. 2. Devices for nondestructive inspection of materials and articles. Guidebook/Under edit. of V.V.Klyuev. - M.: MASHNOSTROENIE, 1986.